A platform for real-time patient data. Through the CARESCAPE Network, real-time patient data is captured to create an electronic medical record and provide clinically relevant trended data. Networks that transport patient data, especially real-time data, require meticulous design, thoughtful implementation, and comprehensive commissioning. The GE CARESCAPE Network whether implemented as a segregated network or as an integrated VLAN on the hospital’s infrastructure delivers a robust and expandable platform for Clinical Information LogisticsTM today and in the future. CARESCAPE SiteLink is a networking capability that allows for remote primary monitoring of patients located at another location, whether it’s across the street or across the state. 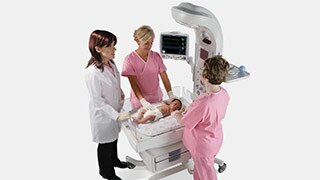 The primary use of this solution is to centrally monitor patients located at one or more remote sites. Reduce transfers Rather than transferring a patient to a critical care facility, a hospital may be able to retain patients through an affiliation with that facility. The monitoring techs from the critical care facility can monitor these patients. A current trend in the marketplace is to utilize VLANs to enable one set of switches to handle multiple networks. With a VLAN configuration, the CARESCAPE Network can share the same switches that the hospital uses to operate all of its other devices including laptops and wired VoIP phones. Simplification The CARESCAPE Network shares existing switches the hospital has installed. Further, IT training can be minimized to a single set of switches and routers. Resource sharing The CARESCAPE Network and Enterprise network share access points for wireless communication, servers for SNMP, DHCP and NTP services and WAN connections for cross-geography data transfers. Networking management One network for all devices can help simplify the overall IT/IS management of the network. CARESCAPE Enterprise Access is a sophisticated antenna system supporting wireless services including WLAN, Voice over WLAN, cellular, two-way paging and WMTS. Because CARESCAPE Enterprise Access can manage multiple wireless services, you stay connected to the people and information you need to help you improve clinical decisions. CARESCAPE Enterprise Access allows you to bring your entire portfolio of wireless services together on one comprehensive infrastructure. Now you can support real-time wireless monitoring and alarm notification for continuous patient surveillance, while simultaneously delivering clinical intelligence enterprise-wide. The CARESCAPE Network offers flexible and secure network options. The experienced and professional Network Design and Integration (ND&I) team can provide comprehensive turnkey or customer-assisted installations. In a segregated configuration, the CARESCAPE Network is physically separate from the hospital’s Enterprise network; it operates on its own switches and Ethernet cabling. Uptime A segregated CARESCAPE Network generally helps support high levels of uptime. Since the network operates on its own equipment, other types of enterprise data cannot interrupt the CARESCAPE Network. Routine IT/IS improvements, maintenance and upgrades of the Enterprise network do not affect the CARESCAPE Network. Performance The segregated infrastructure helps deliver uniform performance because it does not share bandwidth with other enterprise data streams. Security Segregated networks cannot be compromised from other enterprise data VLANs. 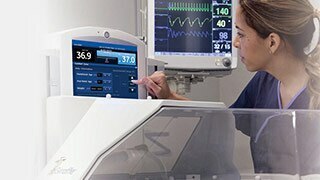 The CARESCAPE Network is an Ethernet-based network that connects GE patient monitoring equipment and servers together. It handles real-time, life-critical patient data, as well as enterprise data to deliver comprehensive networking functionality to hospitals. Share data: Data transferred through the network can have a number of destinations for other uses including populating an EMR via HL7TM, wirelessly sending waveform data to a Tablet PC or cell phone, and automatically sending 12-Leads to a MUSETM system for immediate analysis. The CARESCAPE Network is one of the most comprehensive, real-time patient data networks available today. It conveniently integrates all patient-critical real-time data throughout the enterprise to support informed decision-making. Ethernet-based and IP-based: Its original architecture is based on one of the most pervasive networking standards in computing to help ensure compatibility and ease of integration with other networks. Redundancy: Because it is based on Ethernet and utilizes standard network switches, the CARESCAPE Network can be setup in a redundant configuration to help increase uptime. QoS: Patient critical data can be given priority over other types of enterprise data.